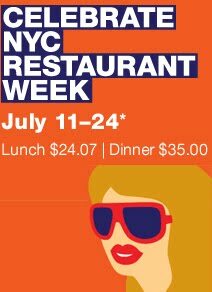 Celebrate the 20th annual NYC Restaurant Week July 11–24 with $24.07 lunch, $35 dinner, events, giveaways and more. NYC Restaurant Week is New York City's original dining celebration. As the country's first-ever restaurant week, it debuted in 1992 when it was developed as a one-time culinary event to welcome the Democratic National Convention (DNC) to the City. Though created to appeal to delegates and other DNC attendees, the program—with 95 participating restaurants—also found a strong following among residents excited to dine at some of the City’s top restaurants for a fraction of the usual cost—$19.92 for a three-course lunch—and who wanted NYC Restaurant Week to be a recurring event. With more than 320 restaurants participating this summer—a new record—there are even more reasons to celebrate NYC Restaurant Week, one of the City’s most exciting and anticipated events, and a pioneer in the dining community.